Lenni Benson, Safe Passage Project’s Founder, Director and Senior Advisor is the recipient of the 2018 Candlelight Award. Presented at the James Jay Dudley Luce Foundation 2018 Annual Gala, Professor Benson was honored with this prestigious award for her leadership in supporting immigrant youth in New York City. 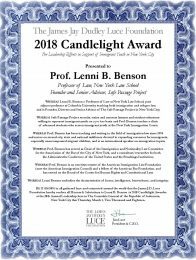 The award acknowledges Professor Benson for her extensive contributions to the field of immigration law as well as her incredible efforts to provide legal relief to immigrant youth. Safe Passage Project couldn’t be more proud to congratulate Lenni Benson on this exciting and well-deserved award!